Want to be notified of our next sale? Tag Sales are inside sales mostly held in homes. Items are tagged and ready for purchase on the opening day of the sale. 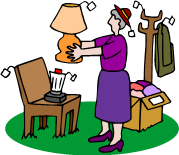 The Tag Ladies bring tables and shelving into the home to set up and display the items for sale. Our sales vary from estate, living estate, liquidation, downsizing or moving sales. Occasionally a few items may be in yard or on the patio. An estate sale is when a person is deceased and the family is left to dispose of the estate. Living estate is when the person is still living but needs to liquidate their items so that they can move to a smaller home, assisted living, nursing home or in with family. Liquidation Sales are when someone has a mass collection or collections or a variety of items that they wish to sell. Downsizing sales are similar to liquidation sales. Homeowners are usually but not always selling their homes and moving to smaller homes and need to downsize or liquidate their possessions. Consignment sales are a host of people who have collections that they need/want to sell but do not have enough volume of items for a tag sale. The Tag Ladies will put all the consignments together for one sale at one location. Each consignor is assigned a specific tag color/alpha number that is placed on each item for sale so that the items can be tracked by the individual seller. The fees associated with the tag sale are divided among the consignors. We have a building for you to bring your items to be sold. The building is emptied after each sale-we do not hold over items or bring items from previous sales. sale. Family sales are full price and are open for 2 hours. This allows family members to purchase family heirlooms, etc. Typically our sales run Friday from 4 PM-6 PM and Saturday from 9 AM-2 PM. Occasionally, our sales will run from Noon to 6 on Fridays. We will advertise this on the web page, flyers and all published advertising. On Saturdays, we close from 12-12:30 for lunch. We ask everyone to leave the sale facility. We do not allow anyone to remain in the facility but Tag Ladies staff. We do not allow early sales or people to come in and view before the sale. Team 2 sale times are from 8 AM-3 PM. Sales at our building are from noon-6 on Friday, Saturday 9 AM-2 PM. We always close for lunch on Saturday. Be sure to watch the advertising and the website for times. Occasionally, depending on the size of the sale, we may extend our hours on Friday or Saturday. On Saturday mornings at 10 AM we begin offering a 25% discount until 12 noon. When we reopen at 12:30, all remaining items are 50% off until 2 PM. Usually the last 15 minutes of the sale, we offer Let's Make a Deal (75% off) on some merchandise. At 2:15 PM, many times we have buyers who buy out the remaining estate. If we announce that you need to make your final purchases, you will be given a five-ten minutes to make your final selections before checking out. If we will not be discounting any items, we will mark these items with a card explaining this. Some sales we will not offer Let's Make A Deal. This decision is made by the estate owners. Team 2 discount times are slightly different–see the Team 2 page. Where/how we advertise:We advertise in the Stillwater News Press with a Sunday display ad and a 3 day garage sale ad. You can find ads in the Perkins and Stillwater Journals, Craigslist, our website, ShopNSwap, ShowNTell and Shoppers Edge. We distribute flyers as well. We can advertise in Estate Sales.net/org/com. Please do not call, text or email asking for prices. We get too many requests and honestly, do not have time to check prices and answer everyone. Ideas and Tips: We never regret the things we buy only the items we don't. When you come to a tag sale, look around to see what all there is. If you see something that you know you can't live without, pull the tag or pick up the item and place it at the cashier's table. Continue looking in all rooms, garage and outside for items that are for sale. I can almost guarantee that you will see something the second time that you did not see the first time. Many of our customers come back several times during the sale because there is always something they did not see the first time or they are hoping something they saw and did not buy is still available. Bid Sheets: Customers can leave a bid on item or items by filling out a bid sheet for items over $100 by picking up at bid sheet at the cashier table.. Your bid must be above one of the discount times by 10% or those customers who are here will be give first preference on the item. Example: you leave a bid on a $100 table for $55 this is 10% above half price. You will list the item, the original price and what price are willing to pay. One of the Tag Ladies will date and time the bid sheet. We date and time the bid sheet so that if more than one person leaves the same bid on a particular item, we will know who placed the first bid on the item. We will call you to let you know if you won the bid. Please remember that someone else may buy it at the tagged price. Filling out a bid sheet does not guarantee you will win the item(s) that you bid on. The first bid has the first option to buy the item if it has not sold at the full or reduced price. You must leave us a phone number to contact you, if we can not reach you by telephone, your bid will not be accepted. If your bid is accepted you can not ask for further price reductions.